The Netherlands suffering a shock defeat and Italy's Buffon making his 1,000th professional appearance were just some of the talking points as the Russia World Cup 2018 European qualifying groups reached the halfway stage. RT Sport rounds up the action. Saturday’s action saw France secure a 3-1 away win over a spirited Luxembourg thanks to an Olivier Giroud double and a penalty from Antoine Griezmann. Luxembourg equalized Arsenal striker Giroud’s opener when Aurelien Joachim scored from the spot in the 34th minute, but Griezmann’s spot kick and Giroud’s 77th-minute header ensured France stay top of the group on 13 points from five games played. Elsewhere, Sweden defeated Belarus 4-0 in Solna to put them second on 10 points, while the Netherlands suffered a big shock, going down 2-0 away to Bulgaria. Dutch coach Danny Blind was sacked following the loss, which leaves the Netherlands in fourth place and in very real danger of not securing qualification for the second major tournament in a row, after the team missed out on the Euro 2016 finals in France. From third place in 2014 to NO place in 2018? Cristiano Ronaldo scored a double in Portugal’s 3-0 win over Hungary to take his international tally to 70 goals. The last meeting between the two teams produced a 3-3 thriller at Euro 2016, but this time it was a straightforward win for the Portuguese team, which puts them second in the group, behind leaders Switzerland. The Swiss kept their 100 percent qualifying record intact, beating Latvia 1-0 at home thanks to a 66th-minute goal from substitute Josip Drmic. The clash of the minnows saw Andorra draw 0-0 at home with the Faroe Islands. Germany brushed aside Azerbaijan 4-1 in Sunday’s Group C action to keep them top of the table. A 31st-minute goal from Nazarov Dimitrij - the first Germany had conceded in Group C qualifying - canceled out a German opener from Andre Schurrle. But the Germans asserted their authority five minutes later through Thomas Muller, with Mario Gomez scoring on the stroke of half-time. A second from Schurrle shortly before the end secured the win and leaves Germany with a perfect record. The Czech Republic thumped San Marino 6-0 away, but find themselves in third place, after Northern Ireland defeated Norway 2-0 in Belfast thanks to goals from Conor Washington and Jamie Ward. After their Euro 2016 exploits, Northern Ireland continue to surprise many and are well set to battle for the runner’s-up spot behind Germany. Friday’s Group D events were dominated by an ill-tempered affair in Dublin, where the Republic of Ireland drew 0-0 with Wales. Ireland defender Seamus Coleman suffered a horrific broken leg in a challenge from Wales’ Neil Taylor, which could see the Everton man miss at least six months of playing time. Taylor was sent off for the tackle, while Wales’ Real Madrid star Gareth Bale was also considered lucky to avoid not being dismissed for an earlier challenge on Republic defender John O’Shea. Bale received a yellow card, which rules him out of Wales’ key clash against group leaders Serbia in June. Serbia now top the group after defeating Georgia 3-1 away, while Ireland sit second, level on 11 points but with an inferior goal difference. Wales are third, followed by Austria – who beat bottom-of-the-table Moldova 2-0 at home, thanks to second-half goals from Stoke man Marko Arnautovic and Hannover’s Martin Harnik. Poland’s Robert Lewandowski continued his remarkable scoring run, netting for the 10th consecutive qualifying game in the Poles’ 2-1 away win over Montenegro. Poland top of the group by six points, ahead of Montenegro. Elsewhere, Romania and Denmark drew 0-0, while goals from Manchester United man Henrikh Mkhitaryan and Aras Ozbiliz helped Armenia to a 2-0 win at home against Kazakhstan, who had defender Segiy Maliy sent off in the 64th minute. England continued their dominance of Group F, securing a routine 2-0 win against Lithuania at Wembley, courtesy of goals from returning 34-year-old striker Jermain Defoe and Leicester hitman Jamie Vardy. Scotland secured a much-needed win against Slovenia, thanks to a late goal from Chris Martin. The win keeps the Scots’ slim chances of qualification alive and puts them fourth in the group. Slovakia jumped to second after their 3-1 away win at bottom-placed Malta. 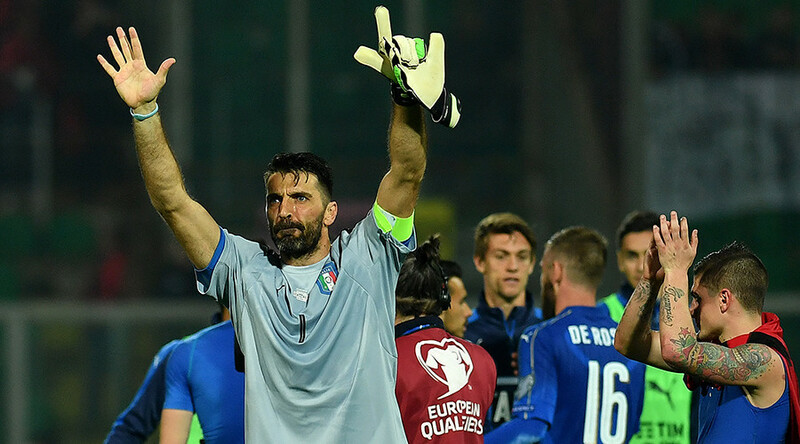 Gianluigi Buffon played his 1,000th career game in Italy’s 2-0 home win over Albania. The game was halted for eight minutes when Albania fans threw flares and smoke bombs on to the pitch. Daniele De Rossi scored a penalty and Ciro Immobile secured the win for Italy late on, as Buffon made his 168th appearance for the national team. Spain top the group on goal difference, however, after overcoming Israel 4-1 in Gijon. Macedonia defeated Liechtenstein 3-0 in the other Group G clash. Greece held Belgium to a 1-1 draw despite being down to 10 men from the 65th minute, when Panagiotis Tachtsidis was sent off for a second booking. Greece took the lead early in the second half, but were pegged back by a last-gasp Romelu Lukaku goal. Greece’s Giorgos Tzavelas was sent off in injury time after an altercation. Belgium top the group on 13 points with Greece second on 11. Bosnia-Herzegovina beat group whipping boys Gibraltar, while Cyprus and Estonia played out a 0-0 draw. Croatia lead the way on 13 points, after a tight 1-0 home win over Ukraine, thanks to a first-half rocket from Nikola Kalinic. Euro 2016 heroes Iceland follow in second on 10 points, after beating Kosovo 2-1 away, while Turkey defeated Finland 2-0 to put them in fourth, level on eight points with Ukraine but behind on goal difference.